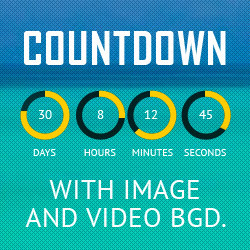 To include a video or an audio file in your website pages, without native player and flash, was a little hard several years ago. Nowadays, when most of the people want to display audios on their websites this can be done using a jQuery Audio Player Plugin. These 8 Awesome Audio Player jQuery Plugins below are lightweight, features rich, responsive and accessible. 8 Awesome jQuery Audio Player Plugin is the coolest article in the field. You can use this html5 Audio Player jQuery plugin as a fully featured html5 audio player (check Playlist version examples) or just to add background music to your website (check Minimal version examples). P.S. 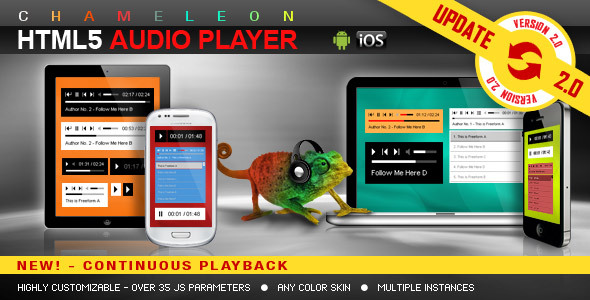 Chameleon Playlist HTML5 jQuery Audio Player Plugin is included in HTML5 Responsive Audio Players Bundle. 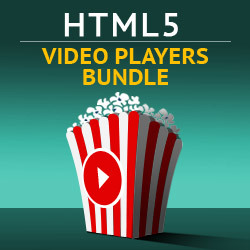 The bundle contains 3 HTML5 jQuery plugins which cover a vast area of audio players, from a simple MP3 player to a complex ShoutCast/IceCast radio player. You can purchase this package with a substantial 50% discount! ULTIMATE RESPONSIVE HTML5 audio player with HUGE amount of options and possibilities.Restyle the player with css into pretty much anything! HTML5 Audio Player PRO jQuery Plugin is the Envato’s Most Wanted contest winner in the category “Best Playlist Audio Player”. Any color scheme is possible, customizable from parameters. It supports .mp3 and .ogg audio files. The autoplay will not work because IOS disables autoplay feature and it can’t be controlled from JS. Volume controllers will not work on IOS. You’ll have to adjust the volume with physical buttons of the mobile device. P.S. 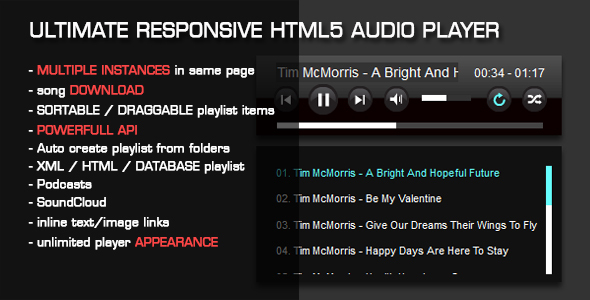 This HTML5 Audio Player PRO – jQuery Plugin is included in HTML5 Responsive Audio Players Bundle. 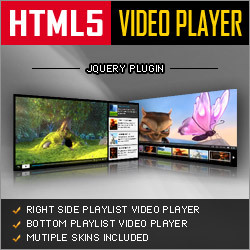 The bundle contains 3 HTML5 jQuery plugins which cover a vast area of audio players, from a simple MP3 player to a complex ShoutCast/IceCast radio player. You can purchase this package with a substantial 50% discount! sPlayer allows you to create a Fully-fledged All-in-one music player with Supercharged features (HTML5 Storage, ID3 Tags Reader, Import Local Files, Offline-Ready and even more.20+ more). It also allows you to create a Cross-platform HTML5 Music Desktop App with powerful capabilities. Supports Desktop Web, Mobile Web and Node.js. and It’s even lightweight. 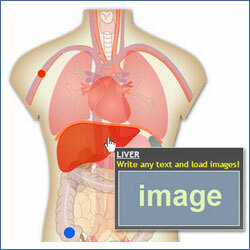 Pure HTML5: Taking advantage of HTML5 power and speed, No Flash, just pure HTML5. Audio Controls: Play, Pause, Next, Previous, Seekbar, loop, duration, current time. 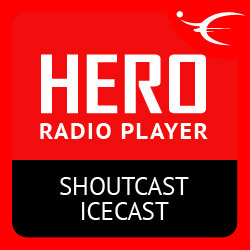 Radio / Live Stream: Radio / Live Stream Remote URLs / Broadcasts such as SHOUTcast and Icecast are also supported. Multiple Audio Formats: MP3, OGG, OGA, AAC, M4A and MP4. HTML5 Desktop App Ready: Build powerful HTML5 Music Desktop app with sPlayer and Electron.io (Atom-shell) / NW.io (Node-webkit). Live Search: Built-in Instant search to find a specific song in your playlists. ID3 Tags Reader: Reading and parsing ID3 tags of songs files (Title, Album, Artist, Genre, Cover art, etc..). Smart Cover: Getting the Embedded ID3 album artwork using ID3 tags reader, and retrieving the album artwork using Spotify API as a fallback. Import Local Files: Music player without your music library doesn’t make sense. with sPlayer, you can import your songs or your music folder, It’s very fast, you can import 100 local songs in less than 20 seconds!, and storing them in the Web Storage to retrieve them again on load. ○ Download Songs: Download songs from sPlayer to your drive. Starred Music: Save the music you love to your starred music. Share Links: you can generate share links to specific songs. i.e. www.mywebsite.com/index.html?sID001, Opens #sID001 Album and plays it instantly. HTML5 Storage: The last played song and your starred music are stored in the Web Storage, and It will retrieve them on load. 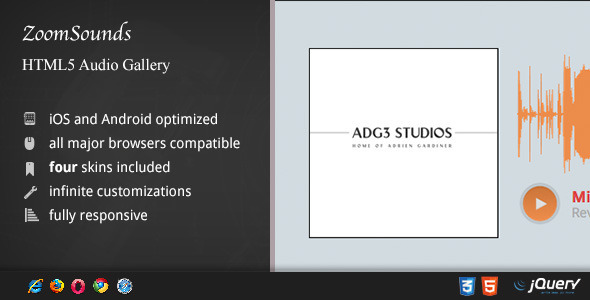 Advanced HTML5 Storage: sPlayer uses external HTML5 Storage library (IndexedDB / WebSQL or localstorage as a fallback) to provide the best experience, It’s used especially for storing the Imported local files. Offline-Ready: No internet connection. No problem. Cross-Browser: The web browsers you love are supported. Lightweight: Small size just as small as ~17kb minified. Highly Customizable: Customize it with CSS/HTML just the way you like it. You can also Customize sPlayer variables and components just for your needs. Well Documented & Extensible Architecture: The Sky’s the limit. A Newly released, premium Sticky Full Width HTML5 Audio Player jQuery Plugin with a cool Vinyl Animation, Continuous Playback, Categories, Share Oprion and much more . It supports .mp3 and .ogg audio files. You can set this audio player jQuery plugin to be sticky for a page or for the entire website. You can also disable sticky feature and just insert it in the content of a page or post. You can choose from the 2 skins available: back & white. Also, from parameters you can create any color scheme for your Sticky Full Width HTML5 jQuery Audio Player Plugin. Want a nifty, cutting-edge, retina-ready, responsive html5 audio player for your site ? ZoomSounds is the perfect candidate. With four skins to fit every brand, only one format required to function, ZoomSounds is the perfect choice for an audio player. tracks and images are not included in the download package. the waveform is a static image it is not auto generated by the audio player, but by a tool included in the download package. full instructions are provided on how to do this and it’s a 10 second job for each track, almost automatic if you have all your tracks in a directory. ThePlayer is a beautiful and elegant responsive jQuery Audio Player with playlist, categories and Facebook and Twitter share option. For each playlist item you can set one category or multiple categories. Option to hide the categories section, too. Facebook and Twitter share option available. Parameters to set the share title and description. Option to show or hide the playlist. Also a button for this action is available. Parameters to set the player and photo corners radius. You can use the audio player in responsive websites or non-responsive websites. Optional parameter enable/disable responsive behavior. You can use multiple instances of the audio players on your website or on the same page. Once one instance will play the others will pause. P.S. Sticky HTML5 Sticky jQuery Audio Player Plugin is included in MOST WANTED JQUERY PLUGINS PACK This bundle contains all the plugins you need to create a complete and professional website: Premium Sliders, Video Players, Logos Showcase, Full Screen Image Or Video Backgrounds, Audio Players, Radio Players, Carousels, Countdowns.